Spray large nonstick skillet with nonstick cooking spray. Heat over medium-high heat until hot. Add sausage, onion and potatoes; cook 8 to 10 minutes or until sausage is no longer pink and vegetables are tender, stirring frequently. Remove from skillet; cover to keep warm. Add egg product to same skillet; cook 3 to 5 minutes or until firm but moist, stirring frequently. Spread each tortilla with 1 tablespoon cheese food; spread to within 1/2 inch of edge. Place on sprayed cookie sheet. Spoon 1/4 of egg product and 1/4 of sausage mixture down center of each tortilla. Fold bottom of each tortilla up over filling; fold right side to center. Fold left side over right side. Secure with wooden toothpick. Bake at 375°F. for 3 to 4 minutes or until cheese is melted. If desired, serve with salsa. Look for reduced-fat smoky Cheddar cold pack cheese food in the dairy case of the grocery store. It is packaged in a plastic container. To make Country Scrambled Eggs, omit the tortillas. Proceed with the recipe as directed, cooking the sausage, vegetables and eggs. Add the sausage and vegetables to the cooked egg mixture and top with spoonfuls of cheese. Cover the skillet and cook until the cheese is melted. Serve immediately, with corn muffins and salsa. 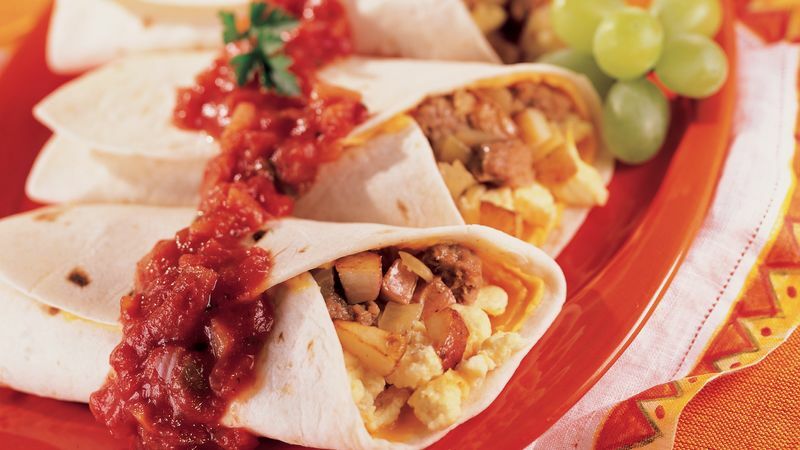 These burritos can also be served for dinner. Add a tossed salad and glass of milk to complete the meal.